The campaigners stood at the gate to Easter Park and the entrance to the church car park offering leaflets to arriving delegates, none of whom were aware of the arms factory, and most of whom expressed shock and disgust on learning of it. One taxi driver stopped to praise the campaigners and expressed his outrage: “There’s far too much killing in the world as it is, and these people are selling more guns from here?” he said. “I’m glad you people are here telling others about this; it’s all wrong.” He took with him a handful of flyers to give to people he knew, and as he drove away he was still shaking his head in disbelief. 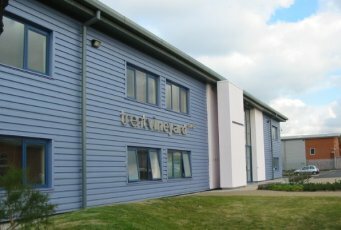 Staff at Trent Vineyard church expressed concern that the campaigners were “disrupting their business” and asked them to move away from the car park, but the campaigners stood fast. The leadership of the church does not approve of the campaign and has always rejected appeals from campaigners and church members to support it. On Wednesday, one representative of the church admitted that while many in the congregation would share the campaign’s concerns, the church is also attended by police and soldiers who would not support a campaign against Heckler & Koch, which is one reason the church leadership will not support it. Relentless rain did not deter the leafleters, who stayed for an hour until all 300 delegates had entered the conference. Meanwhile, two campaigners who had booked places at the conference were leafleting and chatting with people inside. One of the speakers at the conference even mentioned the campaign: Danny Dorling, Professor of Human Geography at the University of Sheffield, started his speech by saying that while he was initially apprehensive to encounter a ‘picket’, once he understood what the campaign was about, he approved of it and asked why more attention was not being paid to the contradiction of an arms warehouse being next door to a conference on health and wellbeing. Hi Folks, big up! What did you do to the “guns for sale” Foto? I briefly was wondering what sense it would make to fake it? Then I thought it`s all real, somebody wanted to make the letters come out right…and it doesn`t really matter, but stuff like that confuses a little bit. The photo hasn’t been modified. It looks to me like the artist used spray paint and a stencil but didn’t manage to keep the stencil flat against the sign and used a bit too much paint, hence the blurry, dribbly look. 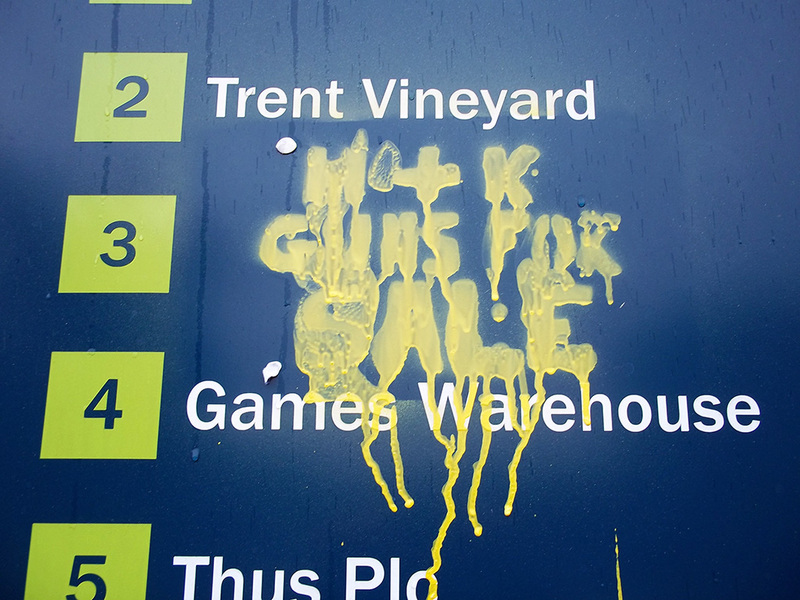 The artist was probably in a hurry to get it done before the security guard noticed!